The internationally renowned Finnish architect and designer Alvar Aalto (1898-1976) created several landmarks of modern design in the United States. The first, the Finland Pavilion at the New York World's Fair in 1939, introduced his pioneering style to the country and established his reputation among his American peers. Subsequent designs produced in the United States marked major turning points in his evolving position as an architect. His commissioned project for the Massachusetts Institute of Technology's Baker House dormitory (completed 1949) features an undulating facade of red brick, a material that references the building's Boston surroundings. Aalto's fan-shaped plan for the Mount Angel Abbey Library (completed 1970) in St.
Benedict, Oregon, his consummate exploration of the library type, capitalizes on the local terrain and the use of natural light. Aalto's designs had a lasting impact on American modernism, but his experiences in America also profoundly influenced his own stylistic development. 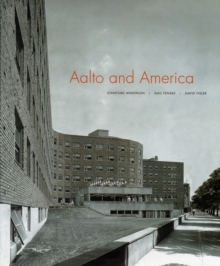 Aalto and America is a detailed survey of this beneficial relationship, with contributions by fifteen international experts who explore these key designs in relation to larger themes in international politics, architectural culture, housing research, and modern criticism and design. Pages: 340 pages, 150 color + 100 b-w illus.